Enjoy Good Housekeeping - UK magazine and unlimited access to over 4,013 magazines on your mobile and tablet. All the magazines you can read for just £7.99 a month. ‘When times are good, people love Good Housekeeping. When times are hard they absolutely depend on it’ Good Housekeeping is a magazine you can always trust; expertise and tireless attention to detail delivered in a positive and accessible way to ensure the readers ‘believe it when they see it in Good Housekeeping’. It is the only general interest women’s magazine to combine unrivalled authority with consistent quality, value and entertainment. Warm and often surprising, it also takes a peek at everyday life, sharing its readers’ experiences and delivering what really matters in life. It sets out to be lively, inspirational and an essential part of women’s lives today. Celebrating its 90th anniversary, the soul of the magazine is the Good Housekeeping Institute, which is housed in a purpose-built high-tech test centre in the heart of London. It is a unique consumer research facility that allows GH to carry out independent testing on a wide range of consumer goods. 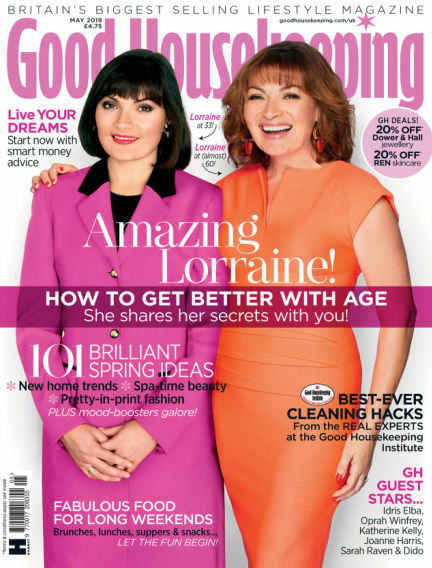 Good Housekeeping provides Tried, Tested and Trusted advice on what really matters in life. The building also houses the Good Housekeeping Cookery School and the demonstration kitchen and consumer venue. For more information on the GHI, please click here. Home and family are core to the Good Housekeeping reader’s life. Quality is her byword. She is an experienced consumer who knows what she likes and invests time and effort in everything she does and buys. She is confident, informed, discerning, organised and up to date. The brand gives the user the key tools to make better choices about every aspect of her life. Editorial pillars include: beauty, consumer advice, fashion, food, health, homes, gardens and real life. Brand platforms include: www.goodhousekeeping.co.uk, 75 Good Housekeeping books, an app, standalone magazines designed to entice potential new audiences, GH branded cookware, and the Good Housekeeping Approved and Reader Recommended Accreditation Schemes, which includes a range of consumer products.